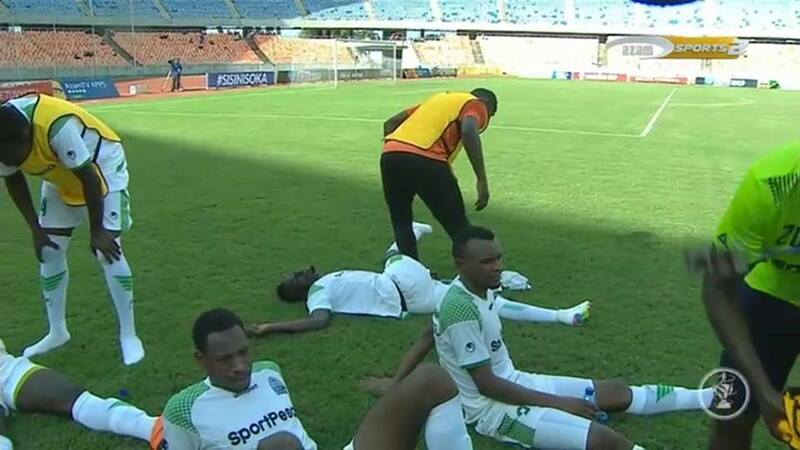 Gor Mahia coach Dylan Kerr, while dissapointed at losing to Azam in the CECAFA club cup semis, commended his players and said the players lost because they were tired. Kerr cited the sheer number of games Kogalo has played in the last 2 weeks. “But I am happy with my player. They did everything possible to win the game despite playing eight games in fifteen days,” he continued. The glut of fixtures has finally taken its toll on the playing unit resulting in injuries. Ernest Wendo (groin), Francis Kahata (knee) George Odhiambo (knock) have all been ruled out of today’s encounter while the defensive duo of captain Harun Shakava (groin) and Joash Onyango (knock) remains doubtful. Kerr says he is not looking forward to the 3rd place playoff against JKU which is scheduled for Friday. “It is unfortunate we got injuries here, but they are from contacts and collision, not fatigue. Kahata has had a knock and Wendo was injured in the previous game, but that is football. “Football is tough and after too many fixtures, it’s bound to take a toll on us. We have to think of how to motivate the players.” said Kerr to the Standard. Gor Mahia will then take on Yanga FC in the CAF confederations cup on Wednesday July 18. Yanga will be well rested after having skipped the CECAFA event. If you dont plan propper then you are planing to fail. What was the good reason to participating in this cecafa thing? You cannot win all the trophies availlable and these is the results of being greedy on the side of EC. Players are human as well they cannot function as robbots. It is now very dangerous that senior players are geting injured may be due to fatigue at the worst moment. Watch out for yanga. The coach had an option of giving the 2nd 11 a chance but he chose otherwise, I think he should just chill and move on , this line of too many games in x days is kind of boring though its a fact. Coach just mentally prep the boys for the Yanga match which is a Must win.Office would do well to come up with a motivational factor to lift their spirits too before the Yanga match like honoring the bonus pledge on Monday and promising a little bump like 10k per player for a Yanga win which would go a long way in psyching them up.I also propose if they win 3rd place EC donates the whole 1Million to them right on the spot for Captain to distribute among playing unit and TB. Mr Kerr, how I do not believe this nonsense. Were YOU not aware how many matches Gor were going to play? At what stage did you realize the players were mentally et physically tired. Why would a club like Gor overreach in it’s tittle ambitions? Look at how sharmfull the cecafa battle has turned out. a). players were involved in too many fights in a short period of time. b). They were grumbling about his bonuses. Secondly, EC should have made sure the club was not going to be engaged in extra time matches. This should have been a precondition for entering the tournament on obvious reasons. Otherwise I reservedly congratulate the players for reaching the semi-finals. This was not my tournament from the word go. The average Gor player is now technically astute unlike what we see in Harambee stars. On this I congratulate the coach. The mere fact that it hardly takes 20min for the club to score a goal should be mentioned. One player that I had lost hope on is Wafula, he has proved me wrong and might even get to the status of Kagere… his own country disowned him but after his exploits in the pitch they quickly realized he was a Rwandan after all. Wafula you have the same predicament, make them come for you! BlackBerry was one player I wanted to see out of Gor but he too is making inroads… and this has nothing to do with those individual runs. When Messi and Ronaldinho do these solo runs they are ALWAYS in sync with the team. Blackberry should adapt more too what Ronaldo(Juventus) does in the pitch and this is good individual skill(which he already has) combined with good assists. I like the part where you say, Gor Mahia is now technically more astute than Harambee stars! One thing though, that I think Gor Mahia will most likely do, if the back room issues are sorted, is reaching the quarter final stage at first asking. I am still trying to put the team Frank Nuttal developed and the current one under Kerr side by side and ok be thing that constantly comes up is he fact that both teams were unique their own ways and always stood out as Gor Mahia! This particular Gor Mahia team has so much potential and a really good opportunity to make history and everything should be done to see that they succeed! To do well against Yanga, Gm need strong support from 12th Man. Can EC start strong campaign for good number to turn up on 18th July . CECAFA is now history every stakeholder will have something to learn from it. Future is good let support the team, TB and the office for now. Serious teams are busy preparing for CAF Competition and Gor Mahia is busy chasing for third play off in CECAFA. Its a shame and big shame…. Very greedy office that Gor Mahia has at the moment.People are looking for money to finish flats(Kilo)using Gor. GOR 1- JKU 0. SCORED BY F.MUSTAFA . GUIKAN, Omondi wasting open chances(numerious). Am partubed by people critising the coach, if one had played soccer you would be able to understand what the coach means about mental and psychological preparedness. under several circumstances you can be ready for a match but the body if not properly conditioned can just give in anytime during the cause of the match. Secondly the coach is a winner and i think that he wants to win every sinle game thus fielding his best 1st 11 in almost every game, so in a nutshell Gor players could be suffering from muscles fatigue due to depletion of glycogen in the body tissue while thier haert and soul is ready but the body will not be able to respond appriopriately.Mean while they need to replenish and condition thier body by eating fluids and stretching thier muscles before any now otherwise Yanga will be a huge call. Mmmmh… this is an amazing team, let nobody joke with this team.Waiting to hear where the one million goes. Congrats TEAM for the 3rd place win. I hope the players get 100% of the money. News that Gor boycotted the dressing room during the SF match is very sad. At this point and time protocol MUST be followed whether you like it or not. Getting to the stadium through the fence is so old school. Shame to the TM who made us do that. We can believe in magic at this time and age. You can’t believe in juju and at the same time make the sign of the cross as you enter the field. Today again we didn’t appear to take the bronze medal and the dummy cheque despite Zico summoning the team.